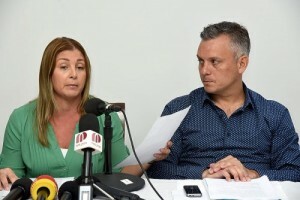 WILLEMSTAD - The moment that partner of Gerrit Schotte, Cicely van der Dijs must serve her prison term, is not yet known. That was confirmed by the spokesman of the Public Prosecution (OM) Norman Serphos. "Unlike Mr. Schotte, this has no priority," says Serphos. Persons serving a sentence of 24 months or longer have priority. Due to lack of space in the SDKK prison, there is a list of a few hundred people who must serve a shorter sentence as soon as there is space. According to Serphos, it is not the case that Van der Dijs' sentence has been postponed because the pair has two young children. "We cannot take this into account, unfortunately, it happens more often that a couple is behind bars." Nothing is known about the request for a petition on behalf of Van der Dijs. The Governor decides on this after advice from, among others, the Public Prosecution Service. This advice has not yet been asked.